.George Washington/Patrick Henry will entertain, motivate, and educate the audience of his role in helping the Colonists overcome all odds and with the support of only 3% of the population achieve victory and independence from Great Britain. Dr. Lance Hurley is an ordained Minister and has a Doctorate from Phoenix University of Theology. He served his country as a Captain in the United States Marine Corps. 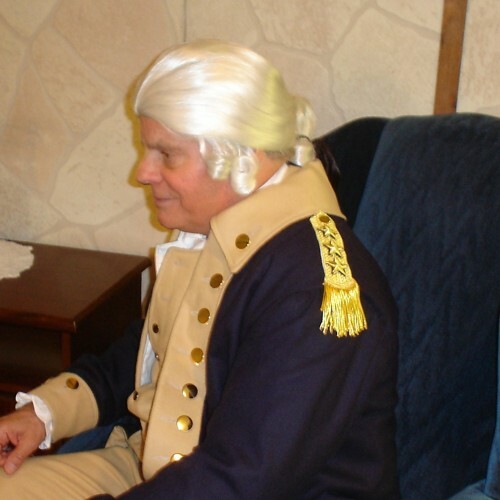 He portrays in character and costume both George Washington and Patrick Henry. He has written a book which is available on Amazon: CHRISTIAN AMERICA COME BACK TO ME 2nd EDITION which traces the history of America from its very beginnings though today. He has spoken at three state capitols on National Day of Prayer, addressed the Arizona Senate and House.He has spoken in 29 states, been on TBN and interviewed on numerous radio shows. For six years, he taught junior/senior high school students his own developed course on the Christian Aspects of the beginning of America as well as the Revolutionary War. His website hurleypatriot..org is full of testimonials. Dr. Hurley has spoken at dozens of public schools as well. Henry and Washington are dynamic orators and audiences often feel "they were there" as they relive their experiences. Dr. Hurley's ministry is dedicated to educating Americans on the true Christian heritage of America. He was a charter member of the National Speakers Association and is a two time winner of the State of Arizona Toastmasters International Speech Contest. Both Founding Fathers address the threats they see to Americas freedoms that are happening today. His messages are not "preachy." His ministry: Founding Father Ministry, Inc. has been awarded the prestigious George Washington Honor Medal, issued by Freedoms Foundation at Valley Forge. His messages are powerful, educational and humorous. He gives a history lesson not taught in the public schools of America. The most common comment he gets from adults 50 plus years and older: "I did not know hardly anything you talked about today." Everything each "Father" says is historically accurate. Please visit my website: hurleypatriot.org. There are over 60 testimonials from schools, churches, political events, etc. Find out more about DR. LANCE HURLEY, ATM at http://HURLEYPATRIOT.ORG.